The last three months of 2017 were quite busy for us. We visited my sister in law who lives in Mexico. We started our trip in Mexico City and headed north through Queretaro, San Miguel de Allende, and Guanajuato. 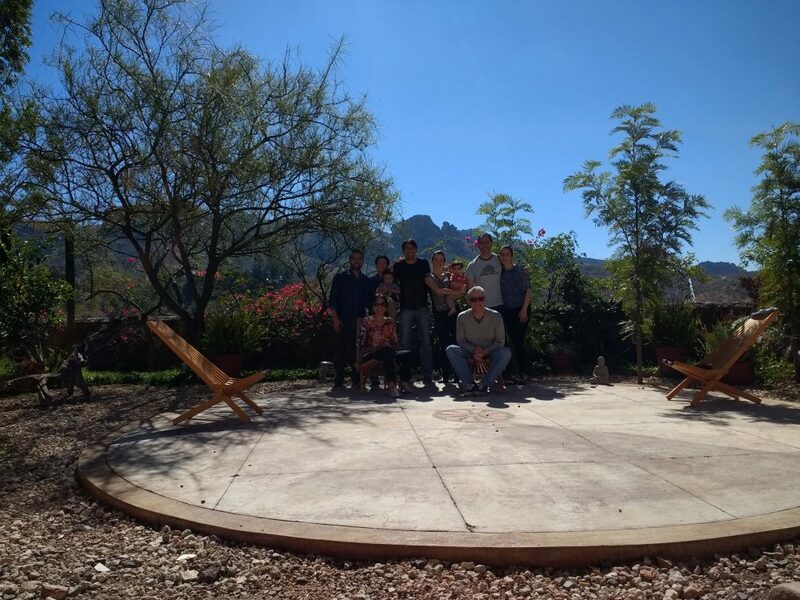 Throughout our journey, we stayed on some really cool Airbnb houses in Mexico (see picture below for the view from one of the back yards). If you are new to Airbnb, you can get $40 off from your first trip when you sign up through this link. Family photo in Guanajuato, Mexico. 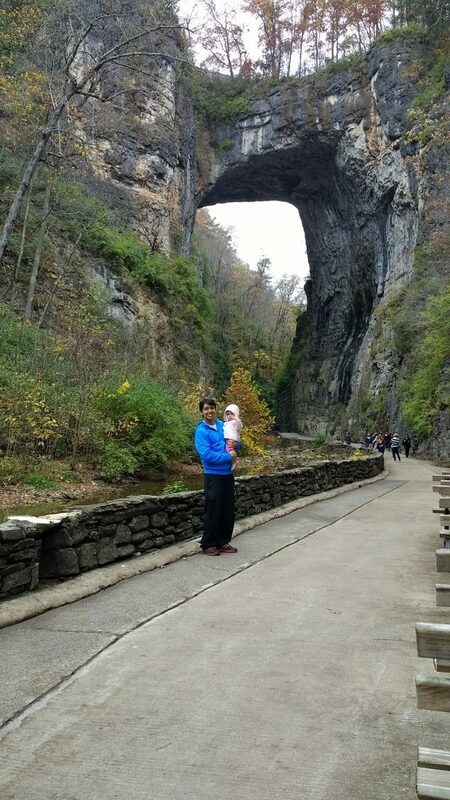 Back in the U.S. we took a road trip through the Blue Ridge Mountains, seeing some great sights along the way! 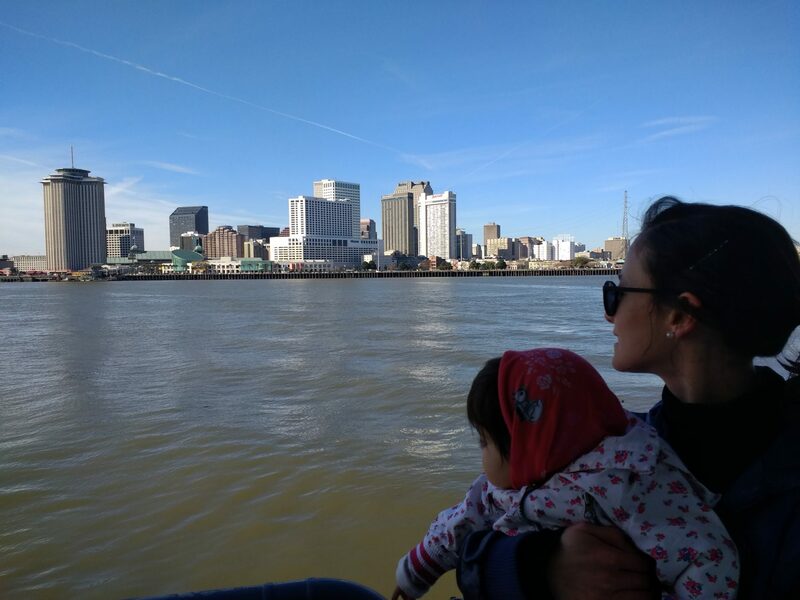 Last but not least, we celebrated all of our birthdays, and traveled to New Orleans for Christmas and New Year. 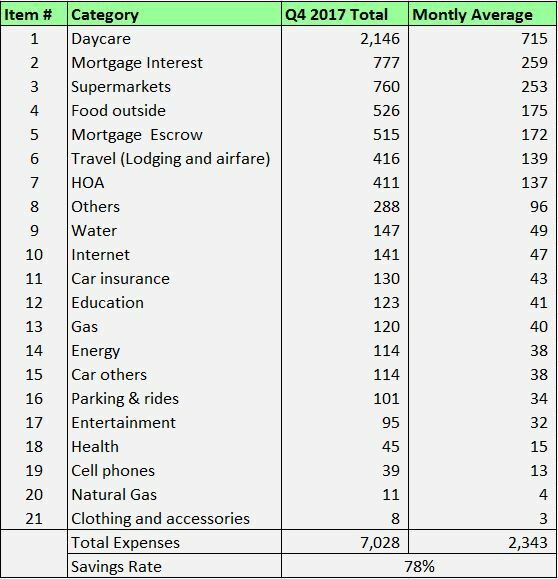 Our expenses were fairly typical during the last three months of 2017, unlike Q3 when we bought a car. Not surprisingly, daycare was our largest expense at $715 per month. Followed by housing (mortgage interest + escrow + HOA fees) at $568 per month. 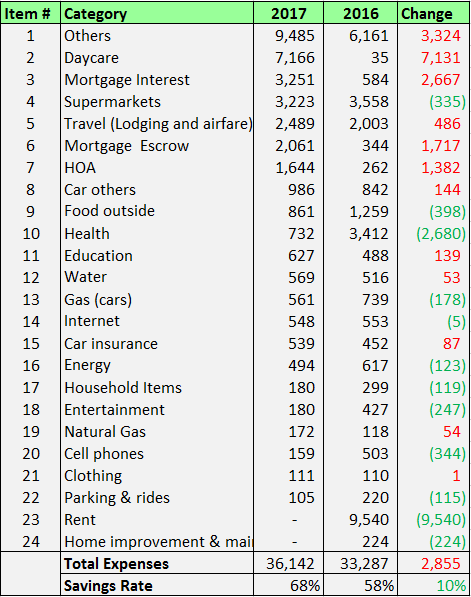 Food (supermarkets + food outside) and travel were the next largest categories at $429/month and $139/month respectively. Both of these were largely affected by our trips to Mexico, Blue Ridge mountains, and New Orleans. We paid for our plane tickets using travel rewards so the out-of-pocket costs there were very minimal. However, we used cash to pay for our share of the Airbnb’s. We also eat out more when we travel and that definitely shows in the food category. Aside from the categories mentioned above, everything else was pretty inexpensive and uneventful, so let’s move right into our total expenses for 2017. Others: almost all of this comes from replacing my very old, two-door car for a nicer, more efficient, and roomier Nissan Sentra 2014. You can see all the details about that transaction here. Other relatively big items within this category include wedding gifts, fees we had to pay for my daughters baptism, and other random stuff. Daycare: daycare continues to be our biggest recurring expense. No surprises there. We were fortunate to have found a great place right across the street from our house as it saves us lots of time, and time after all is our most valuable resource. We were lucky to have found a 10% discount through my wife’s employer. Another strategy we use to decrease the cost of daycare is through the use of a Dependent Care Flexible Spending Account (DCFSA), which allows us to contribute $5,000 of pre-tax income to cover childcare expenses. At a marginal tax rate of 22% this results in savings of $1,100 ($5,000 * 22%). Housing: our housing costs are comprised of mortgage interest (item #3), mortgage escrow for property taxes and insurance (item #6), HOA fees (item #7), and home improvement and maintenance (item #24). For 2017, all of those items add up to $6,956, or $580 per month. We didn’t have any cash outlays for repairs and maintenance items in 2017. We had our washing machine and dishwasher give us a bit of trouble, but nothing we couldn’t do ourselves with a little help from YouTube. Eventually something big such as the furnace or refrigerator is going to break so our long term housing costs should be a little higher. Food: food costs include groceries/supermarkets (item #4) and food outside (item #9). For 2017, these add up to a total of $4,084, or $340 per month. For a family of three, eating 3 meals per day, our total cost per person per meal is $1.25. If you want to only count the adults then the cost per person per meal is $1.87. But let me tell you, formula is not cheap and my daughter has a great appetite :). We believe cooking at home is cheaper, healthier, and less time consuming than eating out. Therefore, we don’t eat out that much. Additionally, we do most of our grocery shopping at Aldi, which I highly recommend. Savings Rate: overall, we managed to save 68% of our income, which is a 10% increase over 2016. Despite expenses being a little higher in 2017, income was also higher since we both worked for the full year, almost (The Wife had a few months of unpaid maternity leave). 2018 is looking even better since we both got raises at work and there are no plans of taking unpaid leave any time soon. On the expenses side, we don’t plan on buying any more cars or anticipate any big expenses. We realize life is uncertain and something unexpected might come up so I don’t want to get ahead of myself and make great predictions for 2018 as a whole. We use Personal Capital, a very useful free online tool, to track all of our finances. From there, it is easy to move the data into a spreadsheet to have it in the format you see above. You can download a free copy of the spreadsheet we use here. Finally, we calculate our savings rate by dividing our total savings over our total income. “Income” includes mainly our take home pay and 401-K contributions. It also includes the occasional odd item such as tax refunds, reimbursements, sign up bonuses for credit cards, proceeds from selling old stuff, etc. The entire process takes 10 to 15 minutes, and you get a clear picture of where your money is going. You work hard for your money! Make sure you know exactly where it is going, and ask yourself if the things you buy with it actually make you happy. The practice of tracking expenses, regardless of what method you use, is one of the most commonly recommended by most of my FI role models. I encourage you to give it a shot if you haven’t already. Want more details on any of the expense categories? Let us know in the comments! Next Should you DIY or Hire a Pro? I traveled to Guanajuato and San Miguel Allende about two years ago. Guanajuato was awesome and San Miguel Allende was also great but different. What were your impressions of the two places? Thanks for the pictures! Thanks for stopping by Hernan! They are indeed pretty different places, both pretty cool. I can see why there is a big community of U.S. expats in San Miguel de Allende. Guanajuato was pretty unique with the narrow streets and alleys, not sure how it would be as a place to live since I wasn’t there too long. Congrats on another great quarter while doing some fantastic traveling! 78% savings rate isn’t too shabby 🙂 we did a “travel hacking sponsored” trip last October to take advantage of points with a focal point around Asheville. Definitely a beautiful area with an abundance of free hiking to enjoy! Q4 2018 Expense Report + Year End Update! Should you DIY or Hire a Pro?